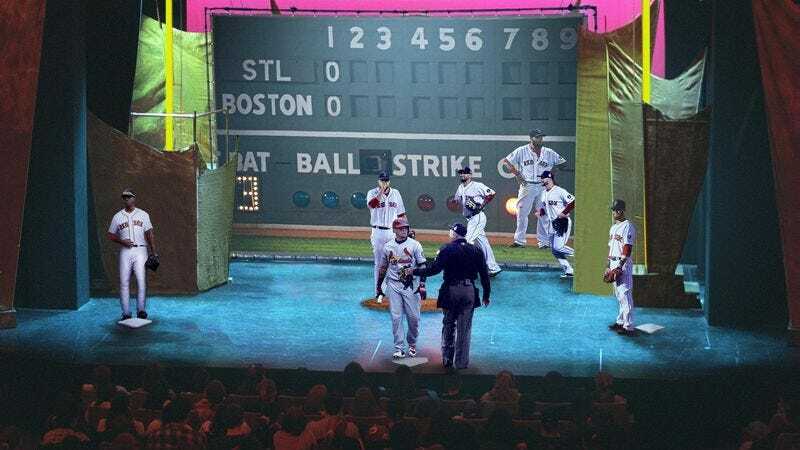 BOSTON—Driving the venue into a frenzy of deafening cheers, the Red Sox and Cardinals took the stage Wednesday night to play the sixth game of the 2013 World Series for a sold-out audience at Boston’s iconic Orpheum Theatre. “This whole place just went nuts when the lights went down; [Red Sox lead pitcher] John Lackey rushed out from backstage and they launched right into the first inning,” said Jordan Steger, one of 2,700 fans treated to the breathtaking pitching, batting, and pyrotechnics displays the two teams put on. “It got out of control for a while there—Jacoby Ellsbury hit a line drive that was headed right at me until one of the outfielders came scampering up the aisle to grab it. Love watching these guys play in such an intimate venue.” At press time, the Red Sox and Cardinals players were involved in a heated balcony-clearing brawl.